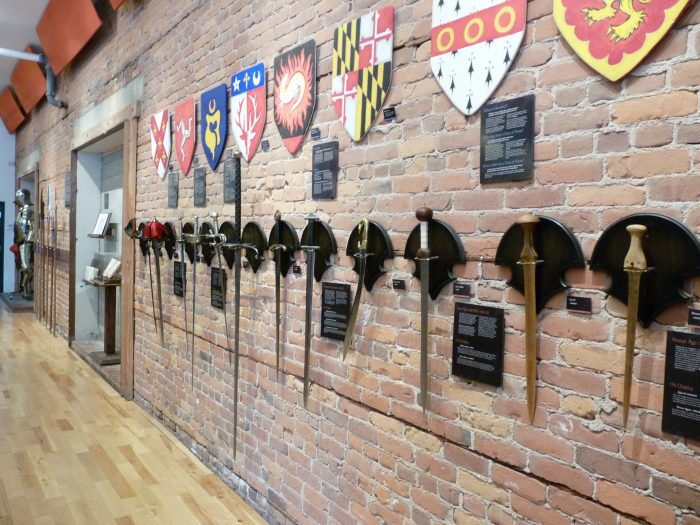 Academie Duello’s historical arms and armour museum combines an informational audio tour with an interactive exhibit featuring weapons, armour, heraldric devices, and fight books from a variety of historical periods. It’s a great place to spend time learning on your own, or to book a private tour for your school group or party. Admittance for the general public is by donation. No weapon holds more sway in our collective imagination than the sword. It has been the weapon of the common soldier, the general, and the nobleman alike; and it has been an integral player in the history of civilization. Four millennia are represented in this collection, which ranges from Bronze Age swords to modern military sabres. Though the queen of weapons may be the sword, the pawn is no doubt the polearm. Weapon of the common man, who had only to attach a sharpened piece of metal to a stout staff to make himself the bane of armoured horsemen, the pole arm was the mainstay of many European infantries. 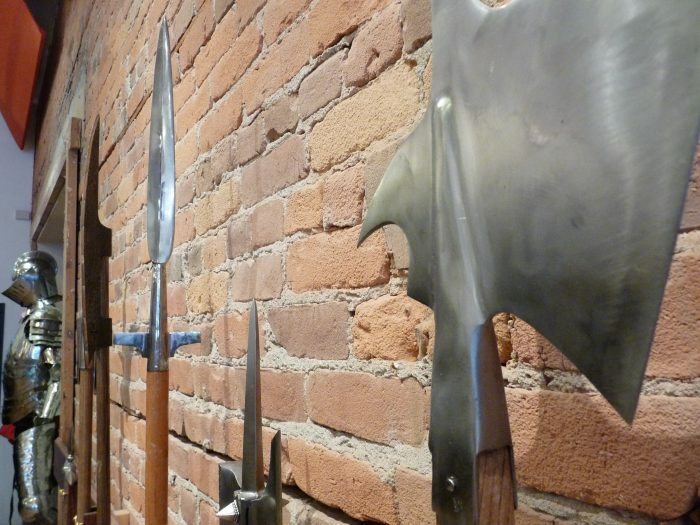 Learn to tell a bardiche from a boar spear and a war hammer from a halberd with this intriguing display of pole weapons. 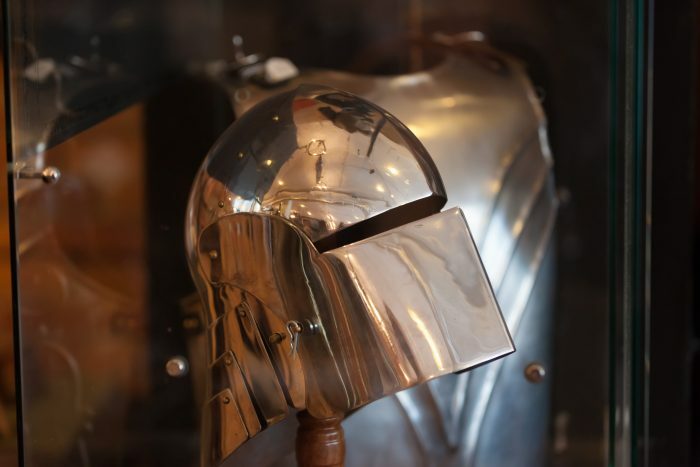 The latter part of the Middle Ages saw the pinnacle of design in plate armour, more often used for tournament and spectacle than for war. Beneath the beauty and craftsmanship, however, remained the serious function of defending the body from harm. Each piece of this suit of plate armour is identified by its name and its role. Far from being a mere medieval fashion statement, the brightly coloured surcoat and shield of the armoured knight identified him to his comrades on the battlefield, indicated his status, and showed his relationship to his family. The styles and rules of heraldry may seem complex and arcane, but every coat of arms tells a story. Illustrated by a set of beautifully hand-painted shields, this display offers to unlock the codes of heraldry. Possessing superior weaponry and armour is only half the battle: the other half lies in the art of defence. Fighting masters were employed in Mediaeval and Renaissance Europe both to train armies and tutor young noblemen in the arts of war. 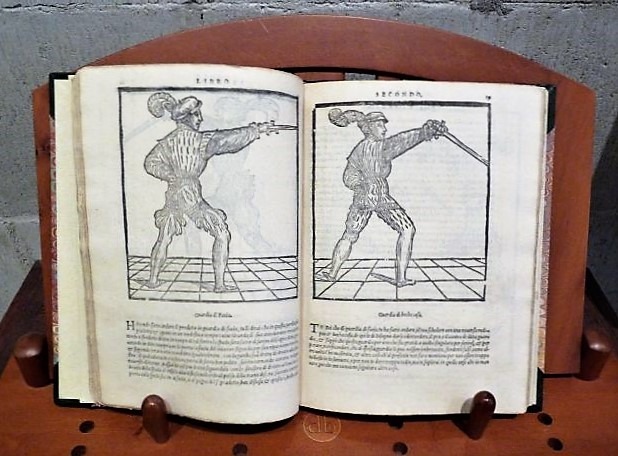 Pride of place in Academie Duello’s museum goes to the sixteenth-century edition of Achille Marozzo’s Opera Nova dell’Arte delle Armi (New Work on the Art of Arms).